Groupon offers Zipline and Observation Wheel Tickets at The High Roller at the LINQ (Up to 28% Off) from $36. The High Roller—the tallest observation wheel in the world—takes passengers on a 30-minute ride above the Las Vegas strip. 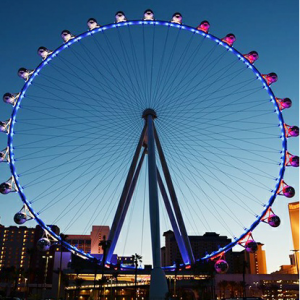 The view of Las Vegas has changed with the world’s largest, tallest observation wheel, the High Roller at the LINQ. Visitors soar 550 feet high above the Strip while taking in breathtaking 360 degree views of Las Vegas. Featuring 28 cabins, holding up to 40 passengers each, the High Roller offers an unparalleled experience both day and night. An interactive journey from start to finish, the massive wheel is more than sight-seeing, providing an ideal place to celebrate, socialize or enjoy the lights of the city. The focal point of the LINQ, dining, shopping and entertainment district located at center Strip, the High Roller is the new centerpiece to any Las Vegas trip. Named the “Must See Attraction of 2015 in Vegas” by the Huffington Post, the High Roller is not to be missed. Book today and take your turn at the top.